Real Estate, Home Inspection, & Insurance ServicesWhen a home is bought or sold, it is understandably put under a microscope. Listing agents, homeowners, buyers, inspectors, and insurance agents alike evaluate the positives and the negatives throughout the process. Insurance Agents: Insuring a home or facilitating claims. As a licensed contractor, Alert Construction has a lot to offer Triad Piedmont real estate and inspector community. Because our company actually started in the Real Estate industry back in 1999, we understand the concerns of buyers and sellers first-hand. Years of experience has taught us what facilitates a sale, and what problems can quickly take a home out of consideration. We are proud of our experience and our A+ Rating from the Better Business Bureau and are committed to earning our clients' trust with every project. Many Triad Piedmont realtors and inspectors rely on Alert Construction for quality work at affordable prices. We're ready to help you make your client happy. "We are a full service real estate agency that specializes in REO properties in the Triad area. 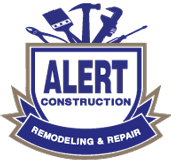 We are able to have all of our needs met by Alert Construction, Remodeling and Repair. They take the hassle out of the equation and make the entire transaction flow seamlessly. Most contractors take up to two weeks to make repairs to properties, while Alert Construction gives you an estimated time closer to two days. Every client that I have sent to them has been thrilled with the results"
"In the typical hustle between the walk through the evening before and the next day's closing, it was discovered that the front porch railing had become dislodged. With a 10 am closing looming, I find that Alert Construction had already made repairs by 8 am without playing any blame game - they just took care of the problem. Their response was proactive and the kind that we need in our business." "Alert Construction is always my first choice when I need any job done big or small. The turn-around time is great. The quality of work is always better than expected." "Just a thank you note for the impeccable work your company did on my home. Everything was done in a timely manner and handled with superb professionalism. Your estimate was substantially lower than other quotes I received. I must say that I was very impressed with not only the cosmetic repairs, but the plumbing and electrical repairs as well." "We would like to thank you for the superior job you completed at our house. The room addition is exactly what we envisioned. The paint job also looks excellent. Your crew does outstanding work in a timely fashion. Thanks so much for the vast improvement to our home." "The house looks great. The guys did a great job. A special thank you to Lisa, who has to be one of the friendliest receptionists I have encountered."